I had a very good beer. Lisa, every good scientist if half B.F. Skinner, and half P.T. Barnum. I don't think I need to see the other exhibits - First prize! One of my favorite, most subtle jokes in the entire series is from that ep. Bart walks past a bookshelf in the living room and reacts with: "Stupid books". Also, any interaction with cupcakes. "Cupcakes? Cupcakes. 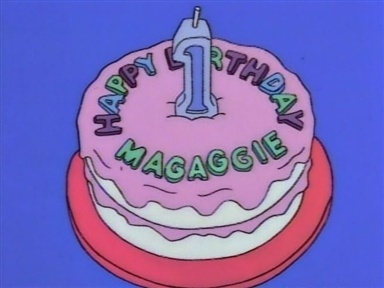 Yes, sweet cakes for all!" My bones are so brittle. But I always drink plenty of...malk? I've gone back in time to when dinosaurs weren't just in zoos! Uh, say, are you guys crooks? I just realized we never had a wedding for the cat and dog-they've been living in sin! Hard work made us quit. "Rats? I'm outraged! You promised me dog or higher!" "Oh I wish, I wish I hadn't killed that fish." "It smells funny in there." Don't worry Bartman, I got held back once, but look at me! Now I'm DRIVING the bus! "Sorry Donkey Kong, you're just not a draw anymore." "Hey, he's still got it!" You can really taste the Chutney! 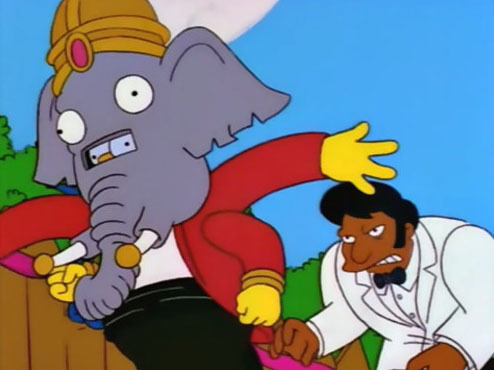 Stop chasing Ganesh, you're just going to get more Wrath! 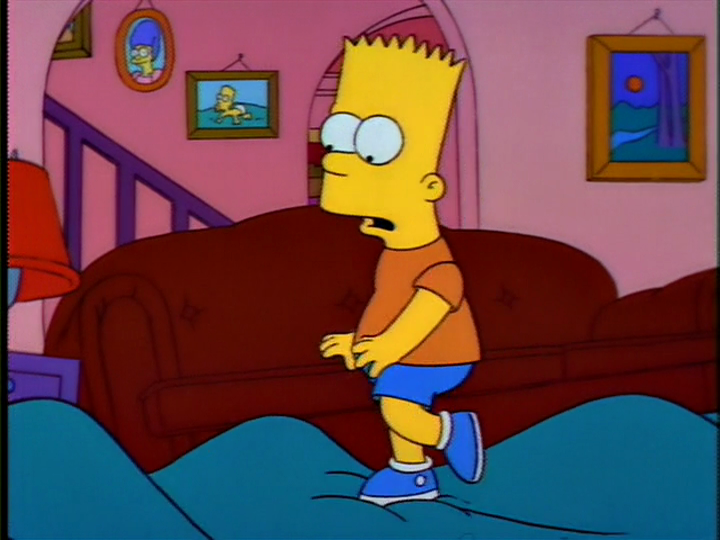 I liked growing up watching that scene and then finally realizing that the "Bart reaches nervously for two cupcakes" moment is a reference to A Clockwork Orange. "Mommy Mommy! Buy me a license plate!" "Hey are you talking to me lady?" "No. My son is also named Bort." 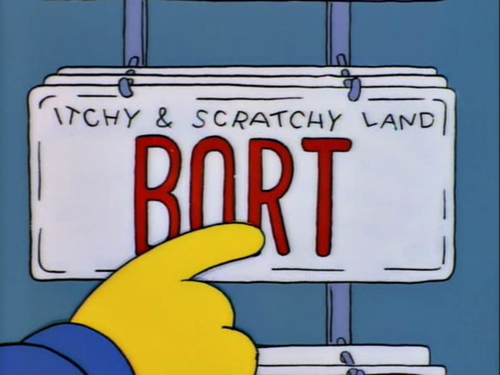 "We are all out of Bort license plate, repeat we need more Bort license plates in the gift shop!" That's a very nice jig, Kearney. Now isn't dancing much more fun than bullying? "Milhouse, you were supposed the night watchman!" "I was watching. I saw the whole thing. First it started falling over, then it fell over." This is such a stupid joke that it crosses over to genius instantly. I don't even know what to call this kind of joke. "Vocal humor"? It's amazing. *splorch* *squish* *crunch* "Hey, watch it!" I'm not greedy, as long as I have my health, my millions of dollars, my solid gold house and my rocket car, I don't need anything else! I heard your dad went to a restaurant and ate all the food in the restaurant and they had to close the restaurant. "Give her this. And this. And then these." "Oh, I'm not a doctor!" "Well, I lost the case. Here's your pizza." "But we won the case!" "That's OK, the box is empty!" "Ve Germans aren't all smiles und sunshine." "My English is not perfect, but I have to tell you, your beer is like swill to us. Do I have that right? I am saying that only a swine would drink this beer."